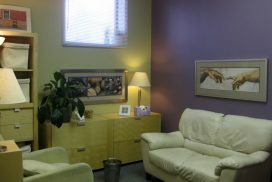 We are located on Pembina highway between McGillvray Highway and Chevrier Boulevard as the major streets. 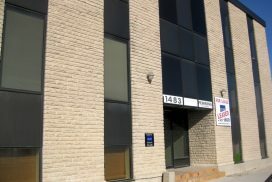 Specifically, we are located on Pembina Highway between Boston and Royse, across from Crane Ave. Parking is available on the street during off-peak hours, and along side streets. The neighborhood is a busy, happening kind of place, so please allow a few extra minutes for parking and perhaps a block long walk to our offices. Right across the street from our office on Pembina Highway is a 7-11 and Tony Roma's. 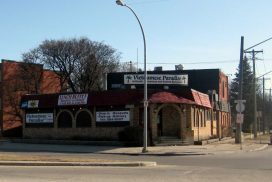 We're a block past the Stella's restaurant on Pembina when you are coming from downtown. This is the view of the side of the building heading south from downtown. 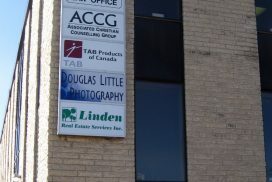 You'll see our business name on the board on the side of the building. When you see that sign, you know you've got the right place. 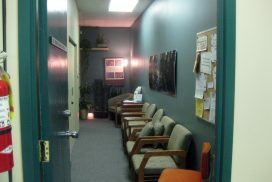 The door to our office is open...and so after you go down half a flight of stairs and into the hallway, as you look to your left, you are immediately see our waiting area. 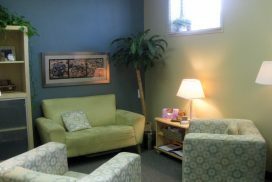 The waiting area generally has soft music playing, and the water fountain trickles amongst the plants. A bulletin board with news and quotes and cartoons can occupy you while you wait, or you may choose to flip through one of our magazines. 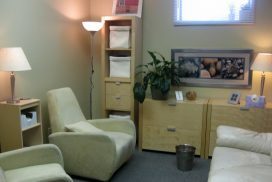 The second office has different furniture and fixtures, but is also carefully designed to feel comfortable and safe. 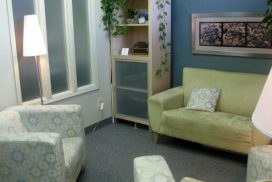 We recognize that people enter these rooms often feeling distracted, distressed, nervous and upset...and work to have the space be a place that is inviting and comfortable.